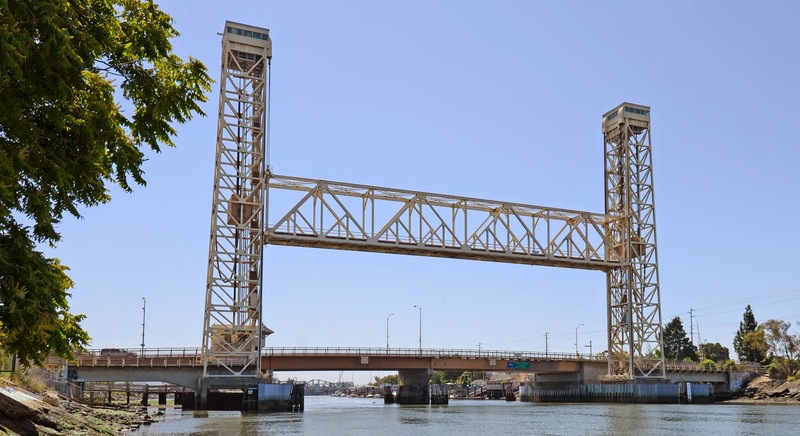 The Fruitvale Avenue Bridges include a railroad lift bridge and a single leaf bascule bridge (also called the Miller Sweeney Bridge). Both bridges connect Alameda Island to Oakland. The Fruitvale Railroad Bridge was built in 1951 by the United States Army Corps of Engineers (USACE). The contractors included Ben Gerwick and Southern Pacific. It cost just under a million dollars to build. The USACE owns the bridge but it is operated and maintained by Alameda County. The bridge includes 185 ft tall towers and a 200 ft long lift span. Although it provides 13 ft of vertical clearance when closed, it is normally kept at 65 ft (mid-open), and can be raised to 135 ft if necessary. The bridge usually carries only one or two trains a day. The Fruitvale Avenue Road Bridge was built in 1973 by the USACE and it won several awards. The contractor was Hensel Phelps Construction and the designer was McCerary-Koretsky with material and technical support from Kaiser Steel. The bridge is 395 ft long with a 128 ft long bascule span and carries about 14,000 vehicles a day. Alameda County, California Bridges: Fruitvale Avenue Bridges across the Oakland Estuary by Mark Yashinsky is licensed under a Creative Commons Attribution-NonCommercial-NoDerivatives 4.0 International License.